From Super Sport to World Sport in 24 hours. 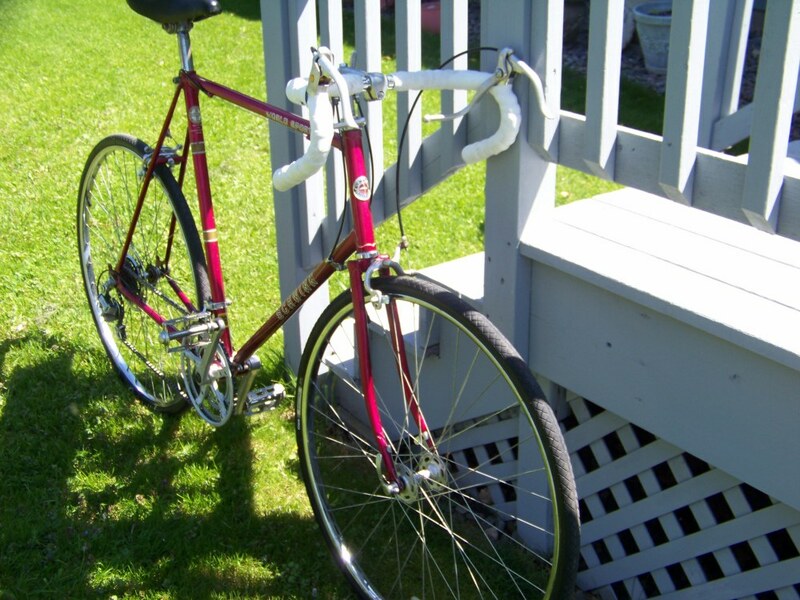 This is Mike S’s early 80s Schwinn World Sport. Last fall I was looking to purchase a bike only to discover they are sooooo expensive! I found this beauty in the dumpster where I live. It was pretty dirty, and the bearings weren’t working that well. Also it was missing a front wheel. So I took it upon myself to learn and fix this bike I found. I found the wheel on another schwinn bike I bought for parts. I took everything apart and degreased and cleaned almost every part. Polished the chrome and the frame of the bike as well. Quick note, the tin foil and water trick worked awesome! 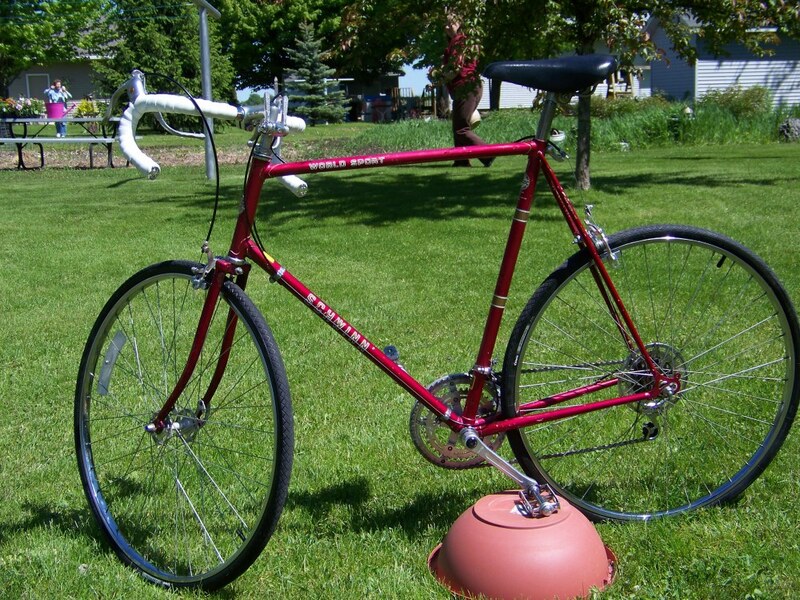 New tires for the wheels, brake pads,chain, handle bar tape were added, as well as new cable and housing. New bearings were also added in the wheel hubs, and the crank and stem were repacked with new grease! Overall, I probably spent more than I wanted to on parts and tools but was well worth it! I wasn’t excited about the stem shifters, but after riding this awesome bike on the trails in Minneapolis and central Minnesota I have grown to really like them! Thank You and Enjoy! Mike, welcome to the OTSG congregation! ” I probably spent more than I wanted to on parts and tools” How well I know that feeling, and if I forget my wife regularly reminds me. Just remember how good it feels to ride on a smooth rolling wheel you personally touched. Great job on the refurb Mike, looks like you got a great bike out of the deal. The nice thing about tools is that you can use them again and again, keep an eye on those Dumpsters! Gotta love the dumpster finds, looks like you did a really nice job bringing it back too life. Love the shine on those rims, but what is this “tin foil and water trick” of which you speak? 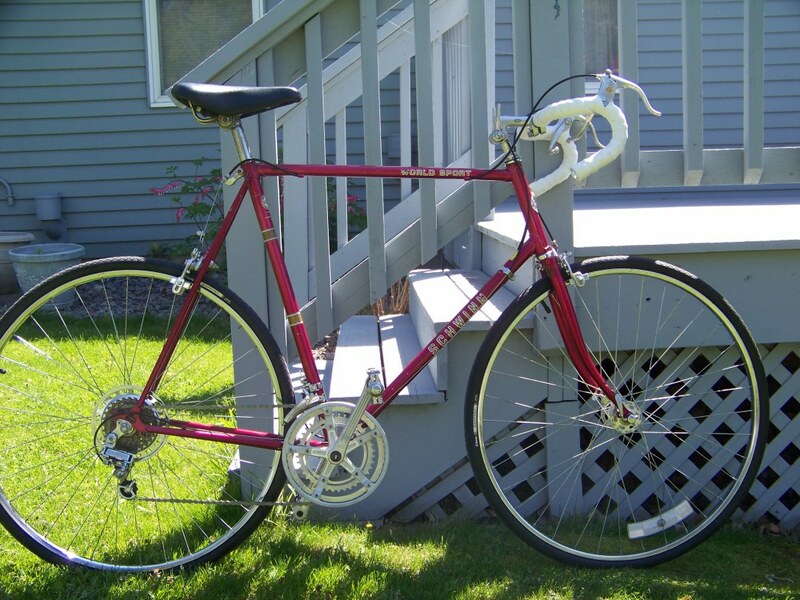 Mike S., I submitted a Schwinn WS a few months ago that looked almost identical to yours but in the female version. The two would have made an awesome set. 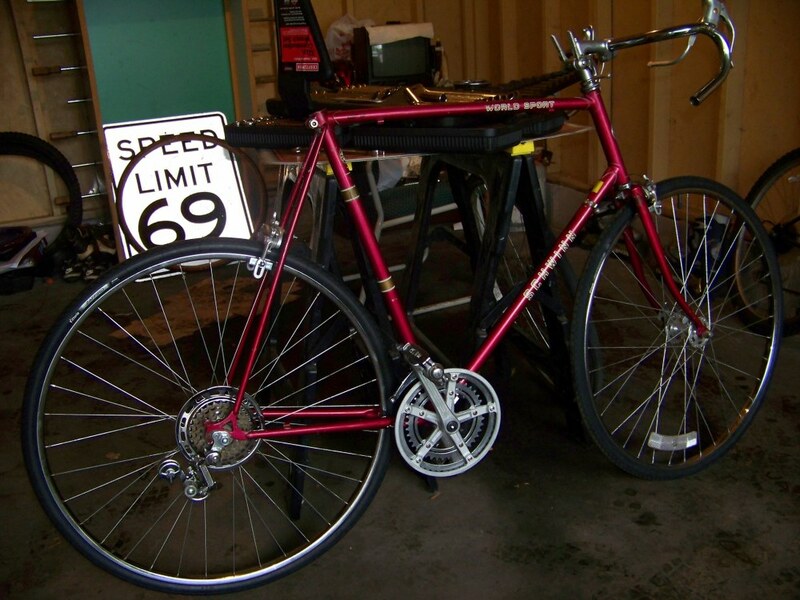 (see tag: Schwinn) Nice dumpster find and great job restoring it and getting it back on the road again. Looks like a respectable daily rider now. The tools purchased will eventually pay for themselves, the experience and satisfaction of “putting it all together”…priceless. 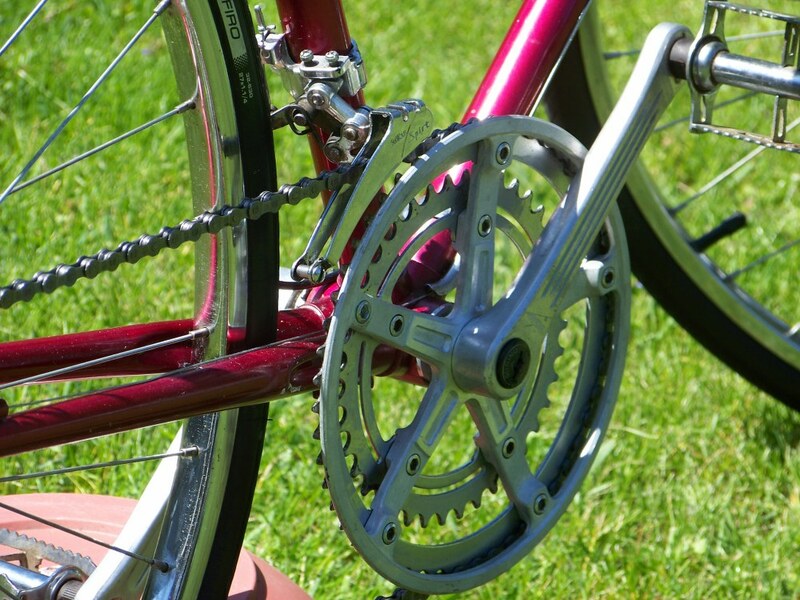 To have a bicycle like that one to ride around on is worth a lot of parts and tools, Mike! Plus, you now have something that ya can’t just run down to WalMart and buy on sale. Nice work! I’ve said it before and I’ll say it again: I’ve got to spend less time on the computer and more time hanging around dumpsters. Cameron, hope all is well with you…been nearly a month since hearing from ya!?! Doc, my email service is acting up again…sorry, not intentionally ignoring ya.